Something strange happened in Iceland at RIMC. About half way through his talk on networks, Matt Roberts from Linkdex analysed the ‘network’ of speakers at the conference to identify ‘who he should take for lunch’ i.e. who was the most influential speaker who he wasn’t already connected to. To my surprise, I was that person. By strange coincidence, Matt and I were sat opposite at the speaker’s dinner. After catching my first glimpse of the Northern Lights and being initiated to Icelandic ‘Black Death‘, I (probably not so soberly) asked Matt whether we could analyse the whole music business community as a network using Linkdex. The analysis was based on recent activity (last 200 tweets). It’s based on twitter conversation. Lots of chat happens via email, phone and face to face, so this is far from gospel. However, that doesn’t mean that it’s not useful or valid as a method of understanding relationships between people. When talking about ‘influence’ we’re referring to someone’s ability to change another person’s behaviour, not social popularity. The most influential people in this analysis are those who have the biggest impact on changing other people’s behaviour. The direction of the arrow indicates who is influencing who. The length of the arrow indicates relationship depth. The shorter the arrow, the closer the relationship. The people towards the center of the diagram are most important / influential in this community. The larger a person’s circle, the more influential that person is generally. The colour of the circles has no relevance (blue is me, orange were the starting nodes). A major limitation of this analysis is that it’s based on Twitter activity. While generally quite accurate, there are anomalies. Who are the most influential people online in the music industry? While there is no clear individual influencer at the center of the music industry, there are a handful of people who collectively influence a large portion of the music business community online: Mark Mulligan, Dave Haynes, Adrian Fusiarski, Ian Hogarth, Jonas Woost, Stuart Dredge, and Ian Rogers. Out of the bunch, Mark is arguably the most important to this community based on influence alone. Which music industry publication is the most influential? Billboard? Music Week? Hypebot? 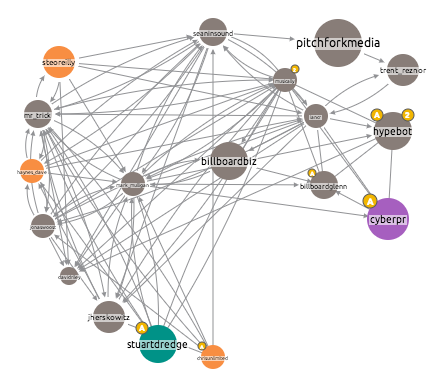 I analysed the network influence of each news vendor to find out how similar or different the paths by which they influence people in the music community are. 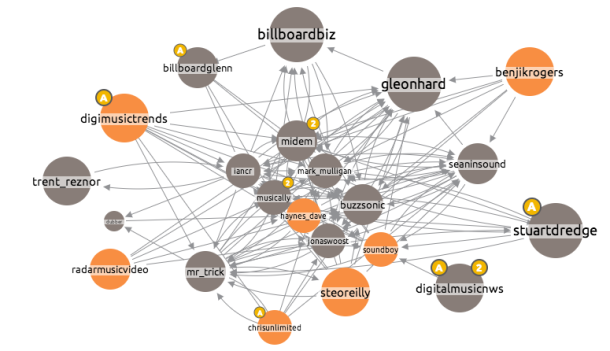 Billboard Biz is heavily influenced by Music Ally, Mark Mulligan, and Ian Rogers. 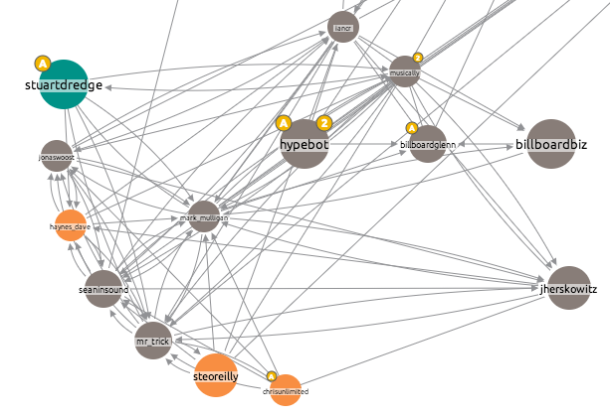 Billboard Biz influences Hypebot, but not vis versa – although Hypebot does influence Glenn from Billboard. Hypebot is not being influenced by many of the key music community people via Twitter, but it is influencing them. Again, Mark Mulligan, Music Ally, and Ian Rogers are the most influential people who are currently influenced by Hypebot. Music Week is a slightly different ball game. 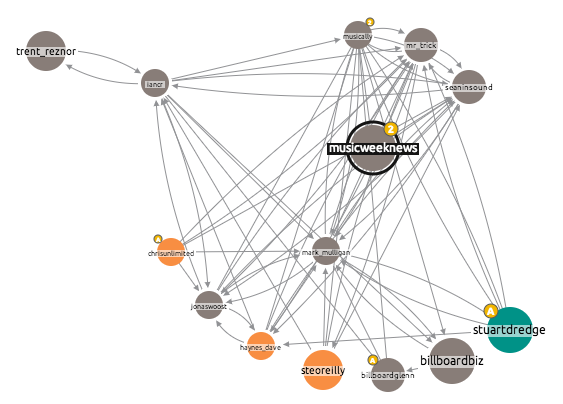 Music Week is influencing Sean Adams (Drowned in Sound), Darren Hemmings, Chris Cooke (CMU), Jonas Woost, and Mark Mulligan. Unlike Hypebot or Billboard, it’s not directly influencing Ian Rogers. So there’s no clear winner, but perhaps it’s fair to assume that Billboard Biz & Hypebot share roughly a similar audience, whereas Music Week caters to a slightly different one. When you break down an industry as a network of people, and you know where you and others fit in within that network, you can be more effective in how you distribute your time, energy, and budget to meet more of the people you want to meet. For me personally, while I have no interest in becoming the center of this network, it has made it clear that there are people who would be good to meet. Why have I not gone for a beer with Mark Mulligan, Dave Haynes, Chris Cooke, Ian Hogarth, or Sean Adams, when we’re clearly connected to so many of the same people, have very similar interests, and are all based in and around London? Mark, Dave, Chris, Ian, and Sean: If you’re reading this, let’s make it happen. As a marketer responsible for creating and distributing content campaigns on behalf of brands in the music industry, viewing this network in this way has helped me appreciate the role that certain brands and people play in the spreading of content throughout the music industry. However, I’m curious as to the way that you’ve applied this definition. Are you talking about “opportunity to influence” (e.g. “We suspect that Bob is often exposed to Adam’s material, because Adam is on his blogroll and Twitter friendslist”) or evidence of influence (e.g. “Bob cites Adam in the content of his posts”)? From the conversations I’ve had with Matt from Linkdex about how this works, I believe it would be weighted towards the latter definition e.g. if Bob tweets something which results in me writing a blog post, attending a meetup, or sending an email to someone, I have been influenced by Bob. The more frequent my behaviour is changed, the closer the relationship / larger the influence. I don’t know for sure, but that’s how I imagine it works. As mentioned at the top of the post, the limitation of this analysis is that it’s based on Twitter activity, so it’s not gospel… but having spoken to a few people featured in the analysis about it, it seems like it’s a pretty decent representation of real life – with a few obvious flaws.